‘Inspector 12, ‘Say what you do and do what you say.’ Binders and binders of documents. ‘Process, process, process.’ These are concepts that will resonate, sometimes (most times?) negatively with anyone who has ever plowed through the process of achieving an ISO9001 certification. These outward signs of a commitment to quality look great on a web site, and the ‘certified’ gold flake on a business card certainly does send a positive message to potential customers. But that’s not what quality is all about. Quality assurance is about advocacy; that is, customer advocacy. When viewed through this lens, QA’s ability to advance an organization’s strategic and tactical goals can’t be reflected, in an illustrative way, on a hierarchical org chart. Plenty has been written about empowering employees to ‘stop the line’ and do whatever it takes to satisfy a customer. If you’ve ever bought a pair of shoes from Zappos and had a problem, you’ll know what that means, for real. In an engineering setting, delighting the customer tends to coalesce around a specific role – Product Manager. This role has one foot in the internal operations of the company and the other foot in the customer’s camp. The unique persp ective of this role can be represented more accurately from a functional point of view as opposed to a block on a traditional org chart. Simplistically, the illustration at the right is not meant to imply in any way that everyone ‘stays in their bubble’ and relies solely on Product Management for customer feedback and intelligence. Rather, it connotes the span of the Product Management function, its ability to influence internal activities and set customer expectations and its reliance on Quality Assurance, another function that cuts across organizational boundaries, in the name of the customer. 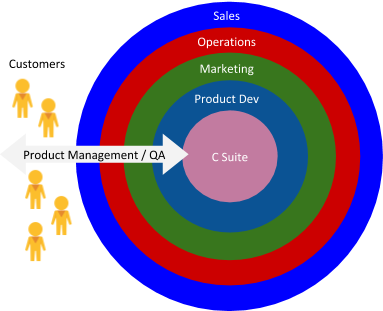 The bottom line, Quality Assurance (for both software and hardware products) provides Product Management with the hard data about internal and field issues (say, failure rates) that can detract / are detracting from the company’s ability to deliver on its promise to a customer, to every customer. This goes beyond the more traditional view of QA as a policing or audit function, and it integrates QA and Product Management in a way that elevates focus on the customer by combining both qualitative and data-centric information. This provides a complete picture of customer satisfaction, emerging needs in a market and what it takes to be a market leader. IQ Inc. possesses decades of experience in assisting its customers in managing and augmenting their Quality Assurance and Testing capabilities, collaborating with Product Managers and others in our customer’s organizations. If you’re facing this challenge today, or see it in your near future, please contact IQ for a free consultation about your needs and how IQ can help you delight your customer.